South Africa’s gastronomy is coming of age as chef’s begin to experiment with indigenous foods and plants to create a cuisine that is bursting with unusual flavours and sharp contrasts, and is quintessentially South African. 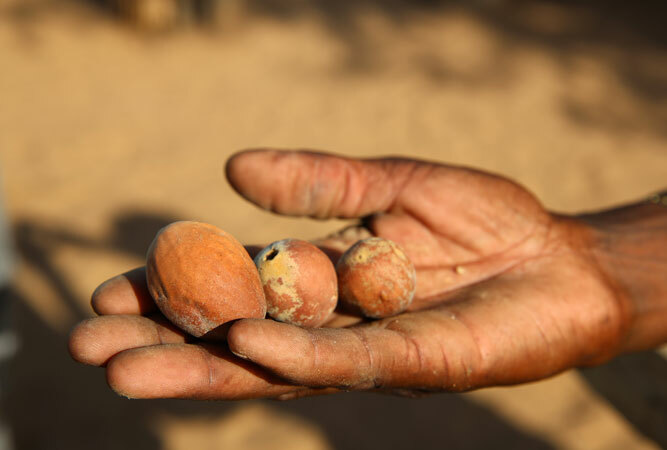 The Marula, Sclerocarya birrea subsp caffra, is an indigenous drought tolerant tree (the same family as cashew, mango and pistachio) and a prolific bearer of fruit. These fallen fruits are the essential ingredient for many local foods. 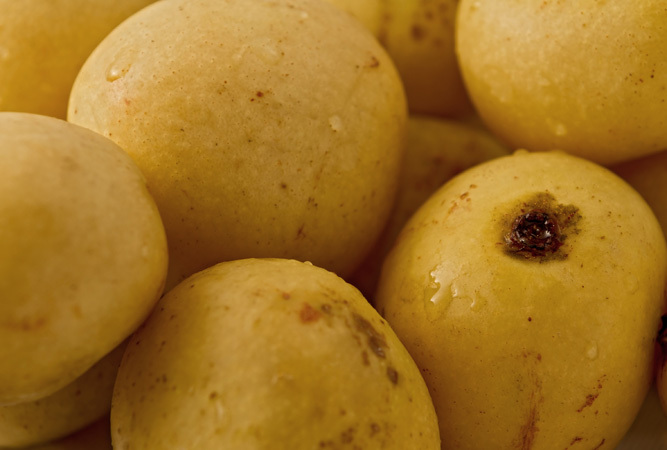 They are brewed to make marula beer, the nuts (seed) can be dried and then cracked to eat, or used as a relish for cooking, and the kernel makes an incredible oil used mostly in the beauty industry but often included in the kitchen as well. And yes, the fruits are the main ingredient for Amarula Cream Liqueur. Endemic to the mountains of the Western Cape, Buchu (boegoe with the ‘g’ said as though clearing the throat) is used for cooking, for its fynbos flavours, and as a tea. The San people used to chew the leaves to keep their mouths clean, and they used it as a deoderant. Its mild minty flavour, with just a hint of aniseed, makes it incredible with a rack of lamb. But even served up with baby carrots, or on a bed of mielie pap, this herb is a ‘wow’. The lowly sour fig is known by many names – ice plant, pigface, and Hottentot fig – all of which describe the indigenous creeping, ground cover succulent that produces a bright pink, magenta or yellow flower, and is found growing wild all over the Cape. Both drought and salt tolerant the plant stabilises sand dunes, the leaves’ astringent juices are antiseptic and can help treat cuts, eczema, bites and sunburn, and the flowers are best in jams, pickles and preserves. One can even dry them to use later. The leaves are apparently good as a kind of spinach. 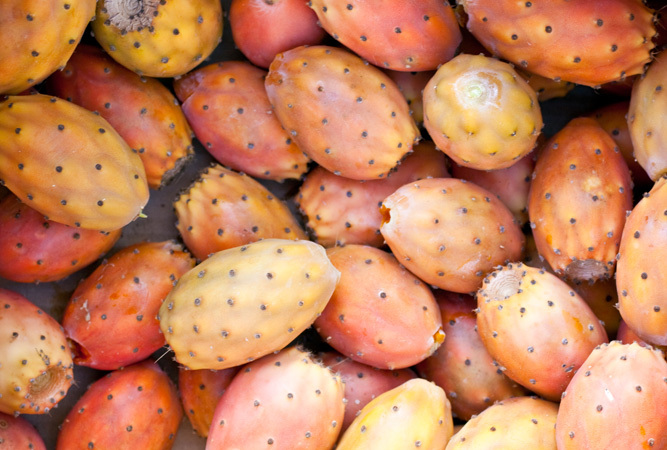 Also known as the cactus pear, prickly pears are an iconic symbol of the Eastern Cape, a common sight along major highways. 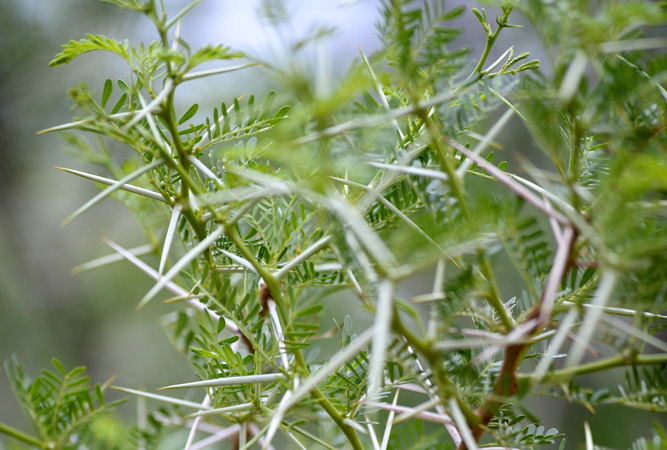 However, they’re indigenous to Mexico and came to South Africa with sailors who used it as an antidote to scurvy. The plant spreads on its own without much assistance and in some areas of the country grew out of control. 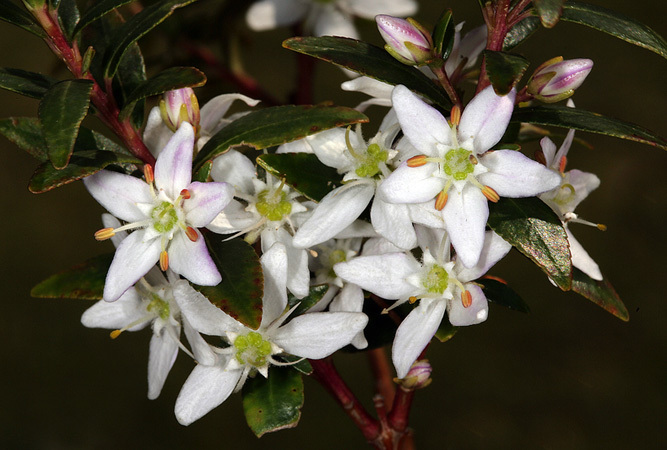 Today it’s no longer regarded as invasive and is harvested by Xhosa women who use it to brew beer or to sell. The fruit is deeply embedded in both African and Afrikaner culture, and is delicious in salads, salsas, sauces, and syrups. 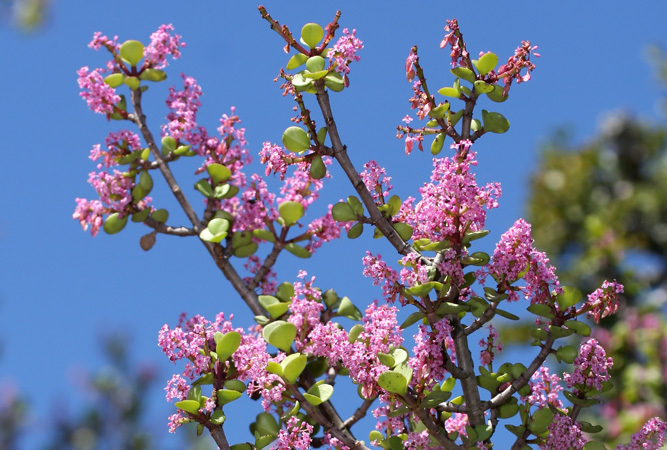 There are myriad reasons to plant spekboom in your garden. It’s water-wise, improves the quality of the air you breathe and is easy to grow, but it’s also so versatile in food that you’ll want at least two big plants outside your back door. Eat just two leaves a day, and you’ll have consumed your RDA. With a very similar taste to purslane, its lemony flavour lends itself to salads, and soups, whilst served up with cheese and preserve it is heavenly. Known also as kraaldoring, slangbessie or African boxthorn (Lycium ferrocissimum) belongs to the nightshade family (tomatoes, brinjals, potatoes) and produces fruitlets that can apparently be eaten when ripe, although this is still a relatively little-known practice. You know you’re onto something big when the likes of KWV launches a Kalahari Truffle infused super-premium boutique gin. Kalahari truffles are found underground in semi arid regions of the Kalahari Desert (in South Africa you find them only in the Green Kalahari region). They’re naturally occurring, and are known as !N’abbas in the Nama language. Like the French truffle they are edible fungi that form a symbiotic relationship with the roots of certain plants (usually the Tsamma melon). This indigenous veldkos is also difficult to find in the wild; you’ll need a guide. But a company known as Woodford Truffles help South African farmers cultivate truffle orchards. Nastergal is African nightshade berry, a wild plant that grows only on the Highveld of Mpumalanga and parts of the Free State and KZN. It has numerous names that include popolo and wonder berry, and is interestingly considered a weed. Parts of the plant are toxic to livestock. Despite this it is used in traditional medicine and one can eat the ripe berries (the green berries are poisonous) and cooked leaves. The purple berries are used to make jam (umsoba) that is delicious on cheesecake, double cream yoghurt and icecream. Most of us know this as wild rosemary, or Cape snowbush. Commonly found growing wild in the veld wild rosemary is easy to find with its thin, grey leaves, burst of white flowers in winter, and distinctive smell. With meat and stews it is simply delicious, with baked roots and vegetables it is heavenly, or you can push the food boundaries by doing a Le Quartier Francais to produce a salt and kapokbos roasted guava to impress your guest. Commonly known as the kei apple because it is native to the Kei River area of South Africa, where it grows wild, the kei apple is bothy a hardy tree that serves as a natural fence, and food. The fruit borne by the shrub is similar to an apple, but smaller (more like the size of a plum) with a high enough vitamin C content to find itself favourably compared to citrus. Those who like their fruit acidic love this fruit just off the tree, but with a little imagination it flourishes as jam, apple crumble, kei apple, ginger-scented cupcakes or even kei apple tomato chutney.